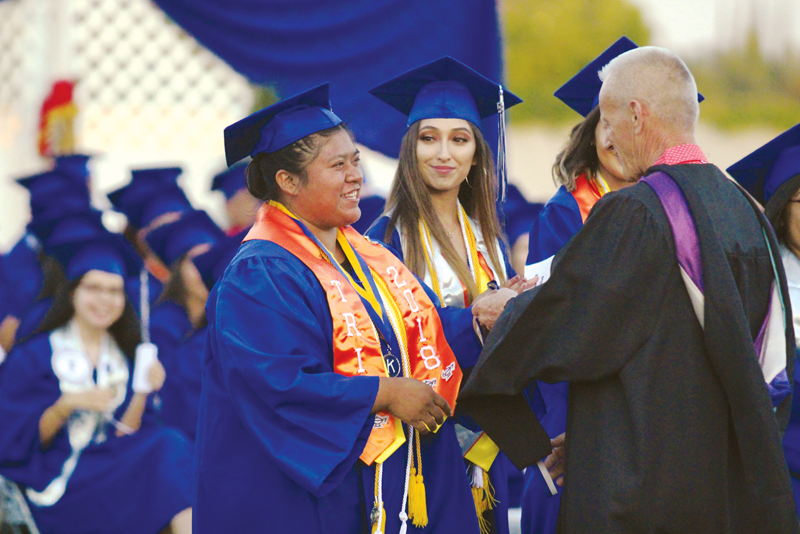 FARMERSVILLE – Last Thursday’s Farmersville High School graduation offered a trip down memory lane for class speaker Ruth Lopez. She thought back to the 2,340 days in her schooling career. The 50 some odd teachers and six different schools she and her classmates had to attend just to enter high school. Then they put in 5,760 hours to get to the point of receiving their diplomas. “It is hard to believe that we had just entered kindergarten, and now we sit today graduating high school,” Lopez said. Lopez and her 167 classmates first got a glimpse of their future home of learning four years ago. Stories were foretold by older students and possibly family members about the physical, mental and emotional challenges that were ahead of them. Many came from the classroom, but a few were a byproduct from their high school environment. Putting place challenges and obstacles during those four years began to mold each student into who they were to become. “We have grown up even if we didn’t want to,” Lopez said. Once more Lopez and her classmates exited though the gates of their school. However, this time it was the last in which their classmates, who they have come to know, would be joining them. “As a family we have continued to grow throughout the past four years, many people have come and gone, we’ve known, and we’ve lost, appreciated and let go, but we’ll always be connected,” Lopez said. Lopez reminded her fellow classmates that once they exit the gates they would face a world full of new challenges. Luckily for them they will be equipped with the skills and lessons they had learned from their teachers. “Our fates await us,” Lopez added. Yet, before the seniors took their final stroll off Farmersville high school campus they had one more task to complete. Following the tradition of past graduating classes, the class of 2018 presented the high school which had helped shape them. Jasmin Zavala presented Principle Lisa Whitworth with a check for $2,000 to be used for the construction of a senior walk between the library and the 400 building. “We are proud to help Farmersville be the greatest little high school in the Valley and to be a part of the wonderful traditions that have been established,” Zavala said. To wrap up the evening’s festivities Principal Whitworth and Vice Principal Rachel Chapman highlighted some of the classes notable achievements. Of the 168 students 86 were women and 16 were born outside of the United States. Thirty- five students received scholarships. Four graduates have already earned a certificate in welding from College of the Sequoias after going through the high school’s agriculture pathway.